It’s not just a phone anymore! It’s been said that the last “just mobile phone” was the Motorola RAZR and aside from basic models still being offered from some services, that’s true. These devices are hand held computers with a focus on lifestyle and social applications. It’s no longer just about calling your mom from the car — it’s about SMS, GPS and a raft of features and software which make today’s cell phones more related to Star Trek’s Tri-Corder than anything Alexander G. Bell ever thought up. It’s also about opportunities to reach people with your message via mobile advertising! According to CMO.com: 40% of iPhone/iTouch users access the internet more on their mobile than their desktop (Nielsen). In fact, U.S. mobile internet traffic across all handsets is now estimated between one third and one half that of wired internet traffic, making the mobile phone increasingly not the “third screen” but, increasingly, the first. A prime opportunity for SMS and mobile advertising! Technology convergence doesn’t happen with the sound of a starters pistol. It happens while we are busy doing other things, quietly and via a succession of innovations which bring applications people find convenient and useful into one handy device. Once consumers adopt the technology the momentum increases almost exponentially and marketers can find themselves caught unprepared and miss opportunities. Do you have a strategy in place for mobile marketing and SMS marketing? 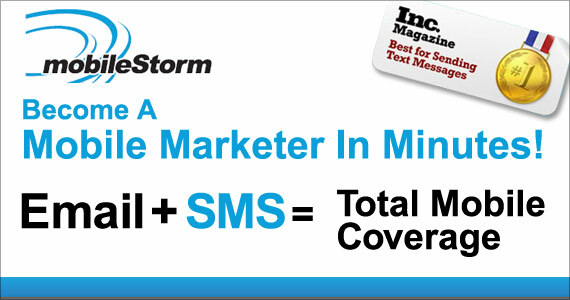 mobileStorm is here to help you take advantage of SMS marketing and mobile advertising! Based in Los Angeles, with more than a decade of email and mobile messaging, mobileStorm has successfully delivered more than three billion messages on behalf of thousands of premier customers such as Overstock.com, NASCAR, American Idol, Kaiser Permanente, and Ashley Furniture HomeStore. mobileStorm is at the forefront of the digital marketing revolution, providing a turnkey SaaS email and mobile messaging platform. mobileStorm has created the most complete solution available while providing expert advice, legendary customer service, and marketing technology that drives ROI and revenue lift for mobileStorm’s customers. We eat, live and sleep mobile SMS marketing and digital advertising. If you’ve been using Go and you’re finding that the daily demands of targeting your audience and managing campaigns has gotten a bit too much to handle, relax. You’re on the verge of going Pro. mobileStorm Pro means having all the digital marketing services your business could possibly need to launch and manage your audience marketing under one roof. Pro takes a multi-channel approach to increasing your returns by allowing you to reach your audience through email, SMS, voice, RSS, fax, and video. Throw in personalized service and expert advice on-demand . . . and you’ve got a match made in heaven. The time has come for your business to introduce or enhance its mobile marketing and digital marketing functionality. The directive has been given to integrate a SMS provider into your email and overall marketing strategy. Now what? You’ve searched the internet, you’ve scoured provider websites and all you have to show for it is a laundry list of “Favorite” links and notepad scribbles that no longer make sense. How do you make the final decision for your company, based on your specific mobile marketing and digital marketing needs? The answer is simple. Read this. What criteria are you looking for in a mobile partner? Expertise in mobile marketing. You may be impressed that the tech person knows the platform inside and out, isn’t that their job? If they do not also understand the marketing aspects, it cannot be called EXPERTISE. 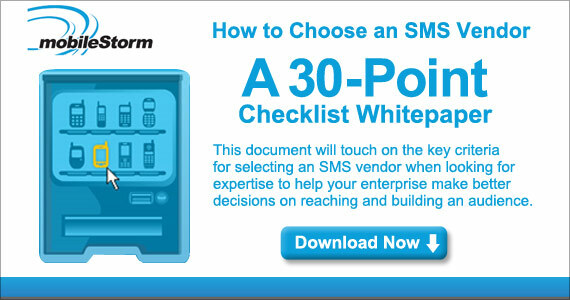 Does this vendor understand and vigorously follow SMS best practices? 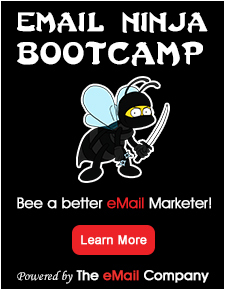 Does the technology meet your marketing needs and your long term business objectives? How to start with a structured pilot program to test your ideas before jumping in head first. Will you have access to a person who can help? A real person that answers the phone. A real person that may offer more than just a simple answer, if that is what you need.